Forsythia is not only a popular garden plant, the cultivar Forsythia x intermedia ‘Lynwood Gold’ is also used in the cut flower industry. Stems of unopened buds are cut and placed where the flowers will open, generally at temperatures of 22C and higher. 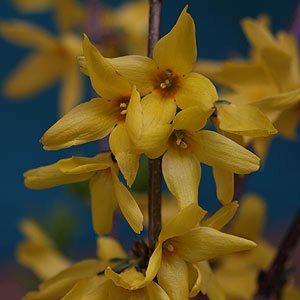 Although half a dozed varieties are available In Australia, it is the popular cultivar, Forsythia x intermedia ‘Lynwood Gold’, that is predominately offered by wholesalers, also known as ‘Border Forsythia’. It can be left to grow into a small shrub with a slight arching habit, where it will reach around 3m in height. Masses of golden yellow flowers in late winter to spring, and good autumn color as well. Ovate foliage with flowers appearing on bare stems before the leaves. Useful as a feature plant, as a flowering hedge or in the garden border. After 2 – 3 year remove 1/3 of old canes each year by pruning to the ground. If you have removed canes for floral arrangements this ratio may be less.